2010 Distinguished Alumni Award recipient Dr. John Bertram is living proof of how Douglas College can ignite a student’s potential. Today, Bertram is a Professor at the University of Calgary, where he serves as Director of the Gross Anatomy Lab and the university’s Body Donation Program in addition to teaching in various programs including biology, anatomy, health sciences and engineering. But in 1976, he was a high school dropout working his way through a series of odd jobs, from paper mills to thoroughbred stables. After hearing radio ads for the then-fledgling college, Bertram decided to register and began filling in the gaps in his high school course work at Douglas College. However, with the guidance of Douglas faculty, Bertram found the educational experience he has been missing. At the time, Douglas College was a very different place than it is today. The campuses in New Westminster and Surrey consisted of portables and Bertram recalls driving back and forth between the two for classes, as well as some of the creative ways faculty worked to bring out the best in students. Despite the somewhat hodgepodge facilities and sometimes unorthodox teaching methods, Bertram gained an appreciation for education, particularly the subject of biology. In 1979, Bertram transferred to the Zoology program at UBC where he earned his Bachelor of Science in 1981. In 1984, he completed a Masters Degree of Science specializing in biomechanics and he was accepted to the PhD program at the University of Chicago. There, he received the prestigious William Rainey Harper Pre-doctoral fellowship and graduated with his PhD in 1988. After completing his post-doctoral training at Dalhousie University and at Harvard, Bertram went on to hold faculty positions at Ithaca College, Florida State University and Cornell. But he says it was Douglas where it all began. 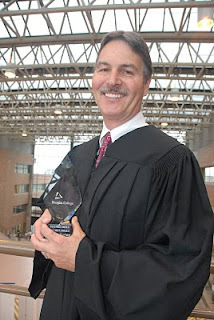 Click here to watch a video of Dr. John Bertram's Distinguished Alumni Award acceptance speech from June 3, 2010.